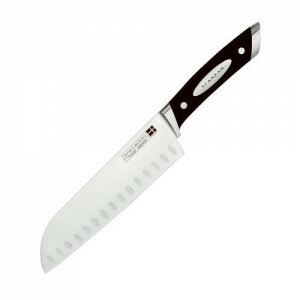 A santoku knife with a friction-reducing Granton edge allows the cook to speedily work through foodstuffs – just like in those fancy Japanese restaurants. Quality, functionality, durability and design: these are the defining characteristics of Scanpan’s stylish and affordable Classic range of kitchen knives. Scanpan Classic knives are hot-drop forged from single blanks of high-grade German stainless steel and individually tested against rigorous standards to ensure that each blade has been accurately tempered to a consistent hardness of 57 HRC. With ergonomic rubberized handles that provide a secure grip even when wet and surgically sharp tapered cutting edges, Scanpan Classic knives make a welcome addition to any kitchen. Click HERE to read reviews from kitchenwaredirect.com. Regardless of what kinds of knives you own, Scanpan’s universal knife block will accommodate them and your collection can be kept in one place and displayed nicely. This piece is easy to clean, fresh, modern and makes a lot of sense: how many of us have the specific knives that will fit the tailored slots offered by conventional knife blocks? Black works especially well in minimalist or contemporary decors. 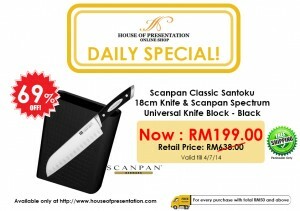 Scanpan today offers one of the most complete selections of cookware available. From their numerous lines of high-performance cookware to their revolutionary silicone bakeware and their high-tech knives, no other name is more trusted by professionals and gourmets alike. 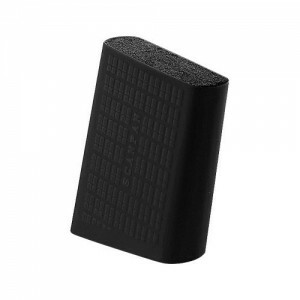 Cleaning & Care: Hand wash block casing and brush only. Do not machine wash. Origin: Designed in Denmark and manufactured to rigid Danish specifications in China. Note* Maximum knife length you are able to put into this block is 24cm.